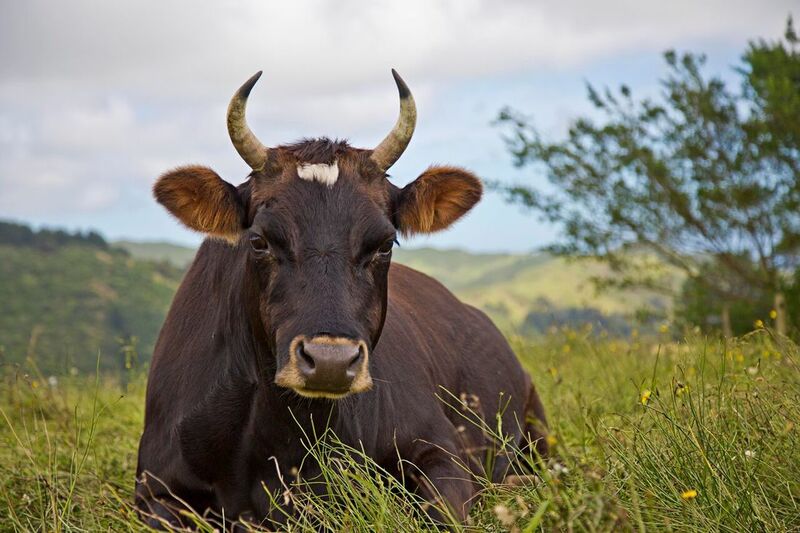 If you walk down the hill at the Black Sheep towards the rooster orchard, you will meet our small herd of friendly cows. 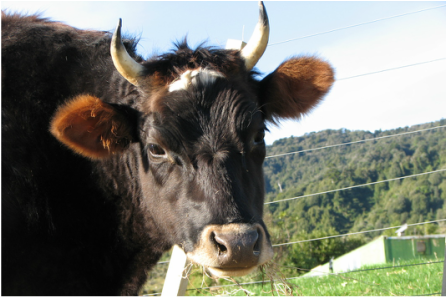 Iris, Poppy, and Hazel are long-term residents, who were rescued from an organic dairy farm along with their friend Lily in 2010. They were hand-reared and are confident and friendly – they love to try and give any passing humans a lick! 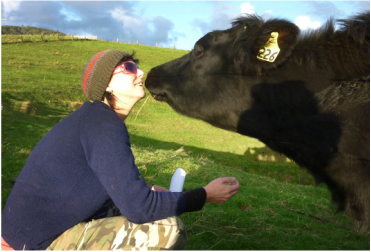 Shortly after their arrival, they were joined by Sirius, a gentle ex-bobby calf with a white love heart on his forehead. He was destined to be sent to the freezing works, but thankfully he was saved, and found a safe home with us! He is now large and handsome, enjoying life with his cow friends. Gypsy and Struan also arrived and joined the herd. Since then, Gypsy and Lily have moved to a wonderful home close by with other vegans, and the others continue to be our friends at the Black Sheep. 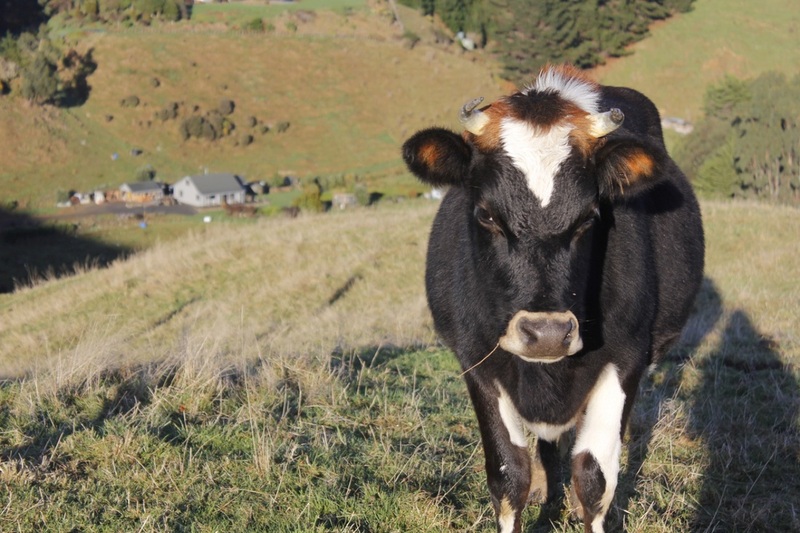 There are over five million dairy cows in New Zealand, and the numbers are steadily increasing, as milk production climbed to over 21 billion litres in 2015. 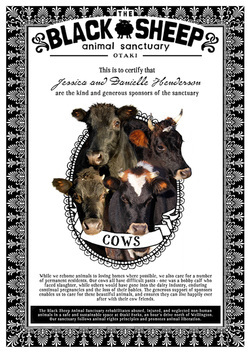 Even though Iris, Poppy, Hazel and Lily came from an organic dairy farm, organically raised cows are still treated as milk producing machines - similar to the rest of the dairy industry. In 2015, over two million bobby calves were killed so that we could drink their mothers’ milk. They are loaded onto crowded trucks for the exhausting, terrifying journey to their deaths. Around twenty percent of all dairy cows are killed annually, usually because their milk production has declined, or because they failed to become pregnant. 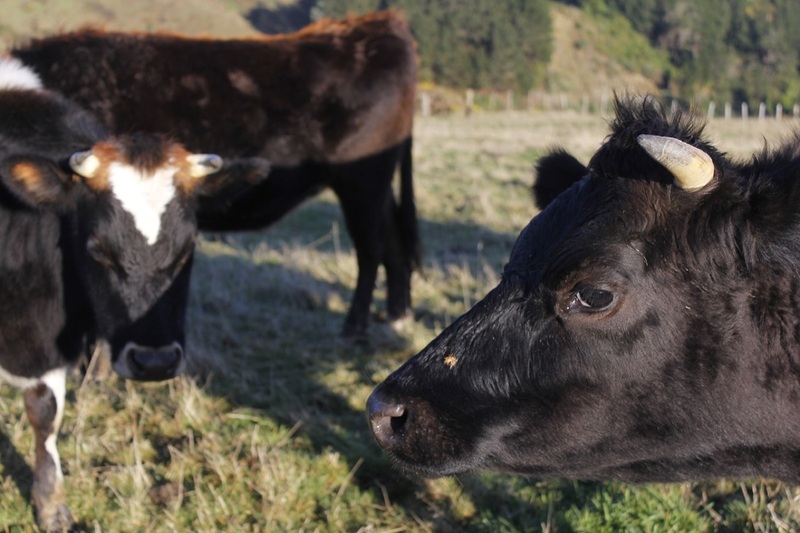 Most New Zealand dairy cows are killed at eight to ten years of age, even though cows can live to the age of twenty-five. 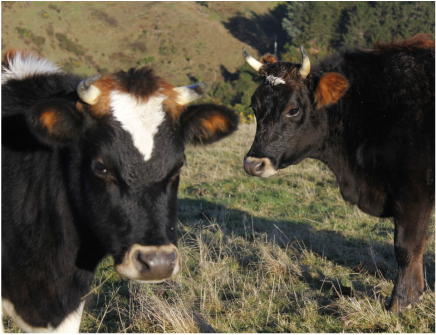 New Zealand dairy farming practices are also becoming more intensive, and herd numbers are steadily increasing. In 2016, over 600 herds numbered more than a thousand cows each. 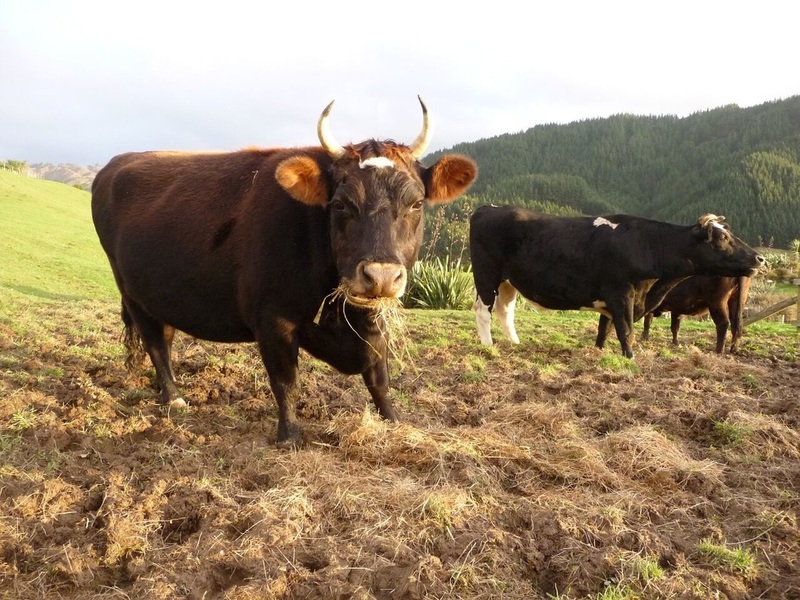 On many farms, large numbers of cows are kept in small paddocks, where their hooves compact and degrade the soil. Farmers try to counteract with soil degradation by pouring on urea-based fertilisers to encourage grass growth. Cows living in such conditions are prone to digestive problems, and other health issues. They are valued merely as economic production units. This will never happen to the small herd of loved cows who live at the Black Sheep, a vegan human space. They are lucky – they will live out their natural lives safely in the company of their friends. Subscribe to our mailing list to find out about working bees where you can meet the Sanctuary cows. Don't consume dairy goat products! 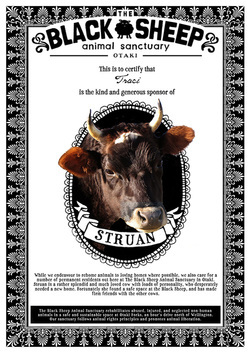 Our splendid Struan began life as a much-loved pet. However, when her caregivers were unable to care for her any more, she was in danger of being slaughtered. Fortunately she and her friend Gypsy found a new home at the Black Sheep Animal Sanctuary. Full of character and personality, she settled in well, and is firm friends with the other cows. Sirius is a young Holstein-Friesian with a white love heart on his black forehead. Holstein-Friesians are the most popular milking cow in the world. However, male calves do not produce milk, and are routinely sent to slaughter shortly after birth. Sirius was rescued when he was only a few days old, and arrived at the sanctuary, where we bottle-fed him. 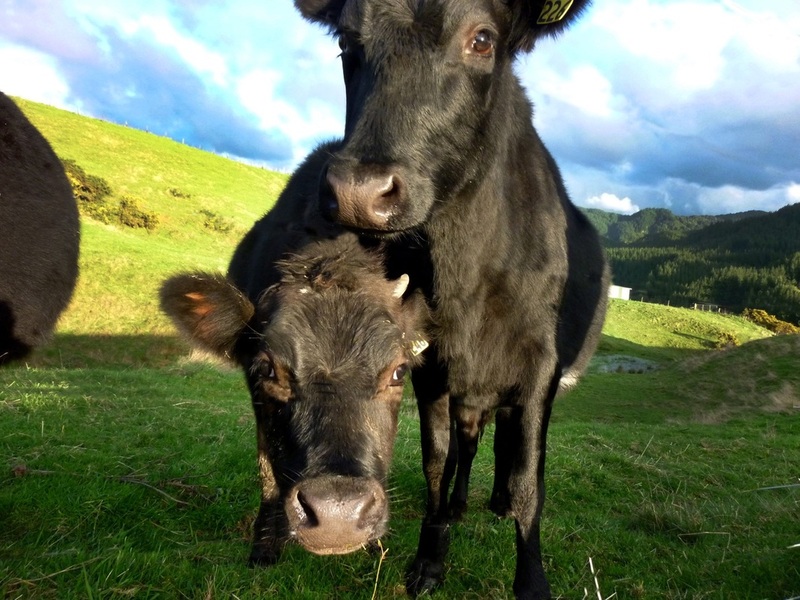 Now he is a large healthy boy, who has formed a strong friendship with the other sanctuary cows.